The documentary, Gulabi Gang is a record of an extraordinary women’s movement started by the extraordinary Sampat Pal Devi in Uttar Pradesh in 2006. 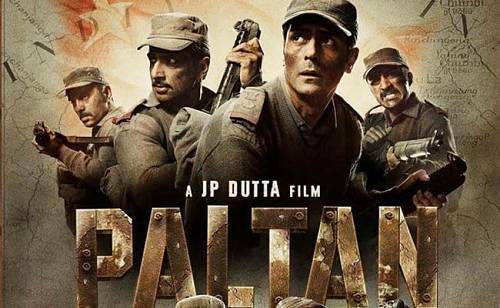 Sampat Pal is remarkable for her strength and courage but Jain also captures the contradictions in this revolution. Pal has power. People touch her feet. She can get things done – in places, she seems like a don. But what she has wrought is incredible and inspiring. Gulabi Gang is a fascinating portrait of the power of one. I’m going with three and a half stars. It is impossible not to wonder if the featured authorities would have behaved differently if there were no cameras hovering over them, but I suppose every documentary must cope with this inevitable margin for error. This still makes for a compelling study of a fascinating group amidst an epidemic of patriarchal darkness. I doubt you will see a more important film this year. Gulabi Gang is an ideology, a searing exercise in awareness, which is why you must make this your mandatory watch this weekend. Gulabi Gang’, Nishtha Jain’s award-winning documentary gives us an up-close view of Sampat Pal and her gang, which dons pink ‘saris’, and hefts ‘lathis’, and fights for injustice where it is most needed. Clearly, Sampat is a remarkable woman, and a remarkable story. The 1.5 hour film is an important document. Clearly, Sampat is a remarkable woman, and a remarkable story. Nishitha Jain’s documentary is a very important one. It’s an eye opener for all of us living in the cities with all the comforts and luxuries. We feel India is developed because that’s the picture we get living in the metros, it is developed but not entirely. The purpose of making this documentary is surely to create awareness. The makers have done their job well. Now it’s up to us to spread the word and recommend this film. Whatever you may be doing this weekend, take out sometime to watch Gulabi Gang. Watch it, because it’s important! Gulabi Gang is a documentary that you should watch with Google at hand. It’s not comprehensive, in that Jain doesn’t delve into either Pal’s own history or the beginnings of Gulabi Gang. Neither does it provide a particularly in-depth understand of Bundelkhand’s social hierarchies. The villages in the documentary could have been in any part of north or central India. 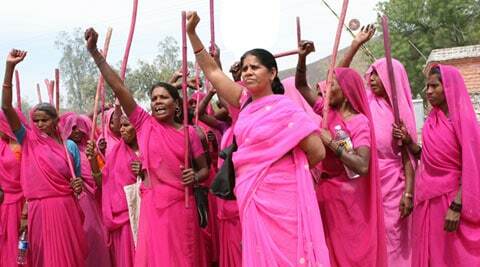 But Gulabi Gang does an offer a glimpse into why Pal, with her ego and her confidence, is such a hero to those who commit to the pink sari: she’s one of the few women who are committed to fighting for other women. Jain carries me with her daunting journey that I will hold on to for many years probably. The instances were revolting, the tall talks about women’s morality – a sham and the despite the distressing situations – Gulabi Gang is a ray of hope, brimming with optimism to change the stringent attitudes with galvanizing ferociousness. I am going with a 3.5/5 and a big thumbs up to the Gulabi Ladies. This movie made a part of your movement in spirit!